Léon Picand was born at Littry, near Bayeux, on 29 August 1901, into a poor rural family. He was called up on 11 January 1940, made his way to Cherbourg and from there he left for the front as a volunteer. He was demobilised in Morocco on 24 July, returned to France and managed to cross the demarcation line without being caught. He succeeded in reaching Bayeux at the end of August 1940 and took up his previous job as a post office handler. On 15 February 1943 the German police from Caen came to arrest him at his place of work in rue Laitière…. After a short period in prison in Caen, Léon Picand was part of a convoy of 994 men who arrived at the Mauthausen K.L “Koncentrationsläger” (concentration camp) in Austria on 18 April 1943. He was given the number 26925. 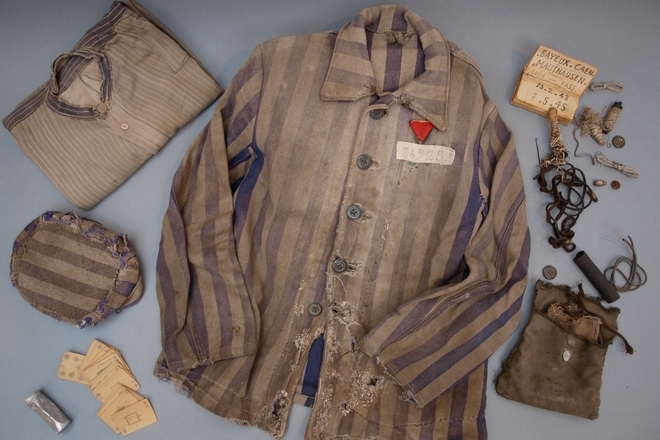 From June until he was freed on 7 May 1945, he spent two years as a concentration camp prisoner digging a tunnel to connect Austria with Yugoslavia at an altitude of 1,068 metres. He was repatriated via Italy, Marseille and the Hotel Lutetia in Paris, and arrived back in Bayeux on 10 June 1945. That very day General de Gaulle, visiting the Bayeux sub-prefecture for the second time, met the first deportees from the Bessin area, who had returned the previous day. In 1995 his daughters Jacqueline and Rolande decided to give the items which had belonged to him during his time in the concentration camp to the Town of Bayeux in remembrance. Today they can be seen at the Memorial Museum of the Battle of Normandy in the section devoted to General de Gaulle.